Susanna Majuri: Kaksoset (Gemini) 2009. Opposite Hanna Nurminen’s desk in her office at the Saari Residence is a photographic work by Susanna Majuri. In it, two women are sliding in a whirlpool of bright blue water, wrapped around each other. Nurminen points to the picture and says it reminds her somehow of herself and her sister Ilona. Then we talk about river eddies and Kone Foundation’s objectives. This leaves me wondering which eddies Nurminen is actually talking about – those that Kone Foundation has tried to find and support or those with which the foundation’s chair Nurminen and vice-chair Herlin have perhaps been personally involved. The text below is based on interviews with Hanna Nurminen and Ilona Herlin, as well as minutes from the board meetings of Kone Foundation, among other sources. Hanna Nurminen joined Kone Foundation in the early 1980s as a part-time representative at the request of her father, Pekka Herlin. In 1989, Nurminen became the vice-chair of the board when her grandfather and the founder of Kone Foundation, Heikki Herlin, passed away. At the same time, Pekka Herlin became the chair of the foundation. As discussed in the previous issue, Pekka Herlin was the one who called the shots, even though he did not read through grant applications very thoroughly. Nurminen says her role was mainly that of an assistant in the early years, but then again, she was also able to wield significant influence on the foundation’s activities by, for example, pushing to make environmental research one of the supported fields. Nevertheless, Pekka Herlin made all the decisions about matters related to the foundation’s finances and about how the foundation was run in practice. Since the foundation had decided, after the death of Heikki Herlin, that board members must resign when they have turned 70, Pekka Herlin was also forced to step down – reluctantly – in 2002. Herlin was already seriously ill at the time, but there was still some drama involved in the change of chairpersons. Herlin would have had other plans for the foundation and especially its funds. The beginning of Hanna Nurminen’s career as chairperson was, therefore, not very easy. She says that without her sister Ilona Herlin, who had already been on the board for several years by that time, she would not have made it. Taking over the management of the funds was a major challenge. With the support of Ilona Herlin and Hilkka Salonen, who had been hired by the foundation in 2001, Hanna Nurminen succeeded. Another area in which Nurminen wanted to make changes was the foundation’s working culture. When Pekka Herlin was at the helm, decision-making was fast and effective, but there was no dialogue within the board or collaboration on the fundamental principles of the foundation’s activities. Nurminen purposely wanted to be a different kind of chairperson, and feeding a culture of dialogue was one of her first goals. Ilona Herlin recalls that the prevailing spirit at Kone Foundation was that everyone was allowed to make their own policies, but the board’s policy was formed concurrently. She has worked in the cooperation bodies of foundations and can vouch that there has been a strong sense of community at Kone Foundation. No one has shot down the ideas of others or shown favouritism in their decisions. Asking for help from board members has also been very natural. Herlin feels that a magnificent team, a sense of community and an innovative attitude have been Kone Foundation’s greatest assets. One concrete reform made at the beginning of Nurminen’s term as chairperson was to move away from the Munkkiniemi Manor, owned by Kone Corporation, to the foundation’s own premises in Tehtaankatu. There was a practical reason behind this choice: Security Trading, which had been organising the assets of Pekka Herlin, who died in 2003, wanted to sell the dwelling and all its contents. The foundation purchased the dwelling and the adjacent one-bedroom flat, although the premises, which today are cramped, seemed very spacious at the time. The story of the small flat attached to the Kone Foundation’s new office contains an interesting link to the foundation’s history. It was there that Anna Oittinen, a nurse who took care of the grandmother of Hanna Nurminen and Ilona Herlin’s grandfather, met her future husband Heikki Herlin, who lived in the same building. Later, in her role as mother of the family, Anna Herlin’s contribution to the Kone Foundation’s activities was limited to supporting the funding of various Christian organisations. Kirsti Herlin, Master of Arts in Literature and the mother of Hanna Nurminen and Ilona Herlin, did not become involved in the foundation’s activities either. It was, thus, not until the third generation that women in the Herlin family took control of the foundation. In Tehtaankatu, the story came full circle and new opportunities opened up. Hanna Nurminen has always had a clear method for learning something new: get into jobs and networks in which learning is possible! In the field of cultural work, learning took place in the municipality of Merimasku, where she was the cultural secretary in the late 1980s and early 1990s. In that job, Nurminen got to implement a wide range of projects and initiatives, from publishing a local magazine to setting up exhibitions. One example of her ideas was to break through boundaries in everyday life by, for example, finding accommodation for young Yugoslavian refugees with local families and organising summer camp activities for them. Work as a cultural secretary was rewarding, but it was inevitable that it was not sufficiently challenging in the long run. Nurminen continued as the vice-chair of Kone Foundation and established a business of her own with the goal of implementing EU-funded cultural projects. Nurminen says that it was possible, at the time, to receive financial support from the EU to revitalise rural communities and channel the support to the arts with the aim of developing cultural tourism. Municipal cultural projects took Nurminen to the Arts Council of Varsinais-Suomi, in which she immediately “squeezed herself into the literature division to learn,” as she puts it. 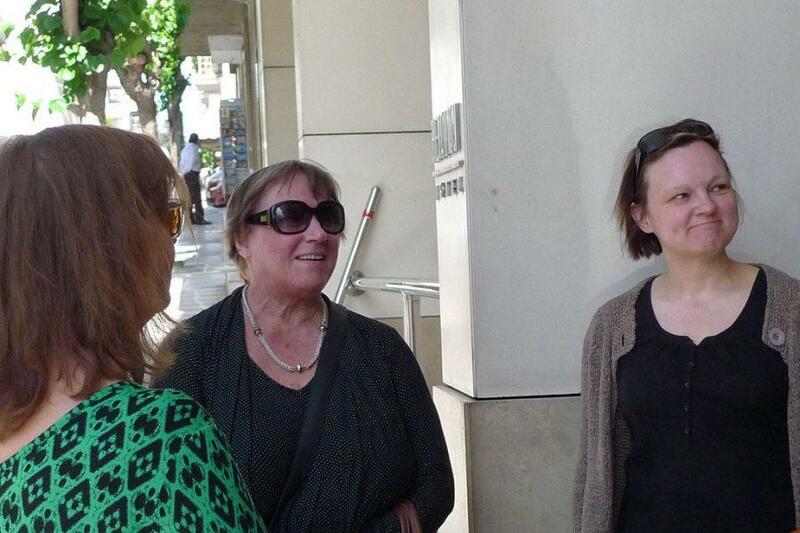 She used these experiences when she launched the Volter Kilpi Literature Week with EU funding. This was a project of major importance to Nurminen, and her role as executive director of the literature week, which continued until 2006, was her last job outside Kone Foundation. Nurminen thinks back to the turning point in her professional identity in the mid-1990s, when she participated in an educational course run from Brussels, European Diploma in Cultural Project Management. Until then, Nurminen had always thought of herself as a linguist with an interest in culture, but as she was networking with culture professionals from other countries, she realised that she was a professional in cultural work. After Nurminen had chaired Kone Foundation for a few years, the foundation’s property began to grow rapidly. At the same time, it became evident that expanding the grant programme would be problematic. The amounts of the grants given could no longer be increased, as there were not that many good applications. Ilona Herlin remembers that support was, at some stage, provided for initiatives that would not have been supported before. The foundation was faced with a problem of supply and demand. The answer was to increase postdoc funding and various targeted calls. In 2005, a decision was made to also step up other activities enabled by the rules. It was decided that one future form of support would be artist-in-residence and researcher-in-residence activities. Nurminen’s background in the field of culture and, in particular, as a professional in funding cultural projects, had a decisive impact. She considers this as the first time she was able to bring together the two different paths in her life, the foundation and culture. What mattered most was that Kone Foundation could truly benefit from her expertise and skills. The decision on residence activities, or the funding of art in general, was not made hastily. Ilona Herlin recalls that initially, when including art among the supported fields began to feel like a good option, Risto Alapuro suggested supporting literature. Nurminen also had a close relationship with literature, not least because of her work as the executive director of the Volter Kilpi Literature Week. A meeting of literature experts was convened, and authors and representatives of the book sector were invited to take part in it. When making comparisons, it was noticed, however, that literature was the form of art that received the most support. Non-fiction was an area of literature that was not supported, and Kone Foundation, therefore, began to fund it. Extract from the meeting memorandum from 2006. In January 2006, the board of the foundation discussed the outlines for future activities. 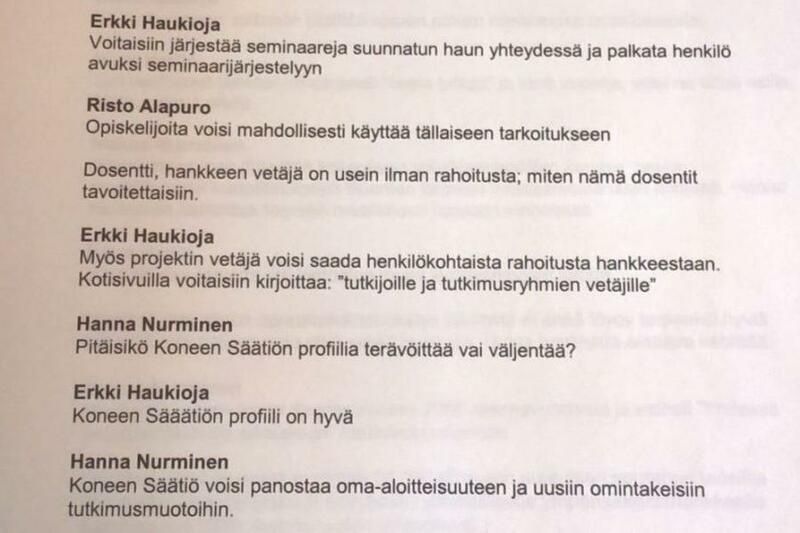 The meeting memorandum reveals that Risto Alapuro argued for project grants, and Erkki Haukioja voiced his concern over the continuity of the funded projects and the large number of young researchers. Hanna Nurminen suggested bringing art and culture to the fore, and Ilona Herlin encouraged an interdisciplinary approach to art and proposed supporting non-fiction literature. The discussion ended with each member of the board being tasked with thinking of larger initiatives to fund. Nurminen began to make preparations for the residence activities. The acquisition of the Saari Manor in Mietoinen was partly a coincidence. Kone Foundation was looking for a potential place for the new residence activities, which at this point were rather undefined and intended to be small-scale. It was helpful in the planning phase that Hanna Nurminen had, in a spirit of learning and networking, joined the division of the Arts Council of Finland that was responsible for supporting residence activities. 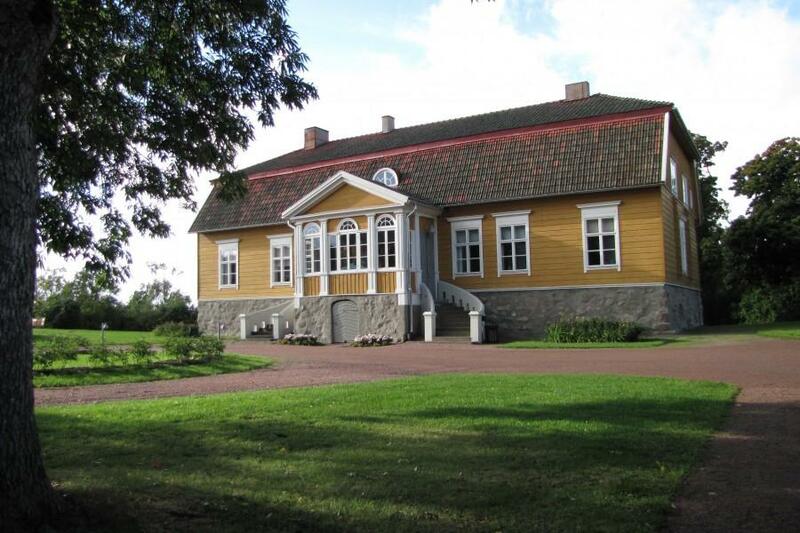 In her home region in southwest Finland, she had seen a local TV programme about the Saari Manor, which was for sale. However, the dilapidated building did not convince Nurminen. When her husband was going near the location to get some spare parts for a seed drill, he asked Nurminen to go along and see the manor. Hesitantly, she went with him. The building was in poor condition, and the original ambience was hidden beneath surfaces redecorated in the 1960s. Nevertheless, Nurminen was enchanted by the grounds and eventually decided to propose that the board purchase the manor. Nurminen arranged for the other board members to visit the dwelling, and they made a joint decision to buy it. The manor and other buildings on the property were meticulously renovated. “There would be no birds without incubation”. Indeed, many multidisciplinary art projects funded by Kone Foundation were born at the Well. Artist residences had at the time, in the early 2000s, been a rising trend for a while. Kone Foundation did not create the trend, but caught up quite fast and the Saari Residence rapidly grew into the largest artist residence operating in the Finnish countryside. The activities have expanded, but the number of staff has remained the same since the beginning. The Advisory Board of the Saari Residence and Hanna Nurminen do not want the residence to be a fortress; they want it to be in contact with the neighbourhood and the surrounding areas more widely. This is one reason why a community artist has also been hired at the residence. Today, large numbers of applications for Saari Residence grants are sent to the foundation, as are applications for art grants. The phenomenon of professionalisation is not seen as clearly in applications in the art sector as in the field of scientific research. Then again, Kone Foundation has increasingly highlighted its wish to find projects to support on the margins and at the interfaces of the art world. To back this goal, a new kind of theme-based application process was tested this year in the arts. Applicants could choose the profile of the person who would assess their application. The first strategy that was drawn up for Kone Foundation was for the years 2010–2015. Of course, broad outlines for activities had been laid down in the early years of Nurminen’s term as chairperson, and a communications strategy had been drawn up at the start of the 2000s. Nurminen was thus not new to strategy work. She was particularly familiar with cultural strategies, which she had been preparing for the customers of her own firm in the 1990s. Nurminen says that in principle, she had all the necessary tools for strategy work when she started out as chairperson, but it took a while before the foundation noticed that there was a need to formulate a detailed policy for the activities. Now, thinking back to her first years as the chairperson of the board, Nurminen says that she may also have been a little shy about her position and with the more experienced board members, and that she perhaps did not always have the courage to introduce new projects. The strategy completed for the foundation in 2010 was based on the idea of seeking alternatives to the mainstream. The supported fields were the same ones that had been established over the previous two decades: humanities, social sciences and environmental research, as well as culture and art. In the 2010s, and indeed throughout its existence, civility and humanism have formed the basis of Kone Foundation. These were now complemented with equality and fairness, transparency, independence, and social and cultural responsibility. Environmental responsibility is another visible value in the activities. Boldness was a word that was chosen to describe the strategic policies of the foundation grant activities. Now the foundation is becoming a little tired of the word. Nurminen emphasises that Kone Foundation is not bold, but that many of the projects that have received funding hopefully are. Nurminen says that the foundation’s first strategy felt like it had been prepared on the basis of training materials, and that the new strategy, which came into effect in 2016, is very different and integrates the foundation’s values into the activities in a concrete way. In the end, she says that a good strategy is one in which there is unanimity about the future direction, agreement on the rules and clear reasons for what will be done. Nurminen spends a lot of time thinking about values. In the grant activities, values are a practical signpost for those who make the funding decisions. Nurminen stresses that values have a very different meaning when, for example, selling lifts than when providing support for art and science. She thinks values form the basis of decision-making in foundations, whereas companies aim to make their business profitable. Nurminen does not want values to be mere rhetoric: they should, above all, be written down to serve as tools for the foundation’s employees and board, and the assessors who evaluate grant proposals. Nurminen has decades of experience of talk about values. Having worked in the culture sector, she has seen up close how trends affect what people talk about. The 1980s was a time when art and science had an intrinsic importance and value, and were not expected to be useful. Then came talk about Europe and how culture strengthens regional competitiveness, in particular. Cultural tourism was primarily seen as economically beneficial. The EU phase was followed by cultural talk about the creative economy and the creative classes, as well as talk about cultural exports. Today, art and culture are often justified by talking about well-being. Nurminen feels all this talk about the utility of everything is mainly corny, and sometimes sad. Where is the talk about art and culture being valuable in themselves, and about research, in the same way as art, being an integral part of a civilised country? A foundation that provides a great deal of funding naturally also shoulders a heavy responsibility. Nurminen asserts that the most obvious responsibility concerns the support system created by Kone Foundation. The selected sectors that have been supported for a long time cannot be suddenly left without support. On a larger scale, foundations have a responsibility for sectors that are not supported by public organisations. This responsibility can be seen as complementary, or even partly compensatory. Nurminen waves her hands to demonstrate how foundations gain more importance when a civilised nation deteriorates, like putting plaster on walls to support a structure. Earlier, the guiding principle in the activities of the foundation was opposing the mainstream. Today, the idea is to look for multidisciplinarity and countercurrents. Nurminen feels that they are still not quite sure how they understand marginality at the foundation, and that discussion on this topic must continue. Ilona Herlin sheds light on the background of departing from the mainstream, explaining that both she and Hanna Nurminen have been acting at the Council of Finnish Foundations and know the landscape of Finnish foundations like the back of their hands. That is why they wanted to establish a policy of their own regarding the support of art and culture, and this led them to choose margins and emerging fields of art. In addition to education and humanism, Kone Foundation’s activities are based on a value that would have been unthinkable in the 20th century, in the days of the old boy network. That value is feminism. Nurminen proclaims herself an old-fashioned feminist who wants to break down traditional structures that undervalue women. Years ago, when her home was being renovated, Nurminen got fed up with how the renovators took her husband’s suggestions seriously but dismissed every one of her ideas as “another stroke of ‘genius’ by the missus”. Nevertheless, the foundation has not publicly emphasised feminism in Nurminen’s era, or organised targeted calls for women’s studies, for example. In practice, the majority of the foundation’s employees are women, and most of the board members in the 2010s have also been women. Nurminen wants to define an organisation maintained by women as one that involves more caring, transparency and dialogue. At Kone Foundation, intuition is also accepted as grounds for decision-making.